I keep this nutritious and inexpensive life saver on hand weekly. It’s perfect for any season, because it’s such a quick and easy snack item to make and it’s so good for you, but in the summertime it’s so nice to have a no-cook option that’s packed with protein! I must confess though, I’ve never used tahini in my hummus. I may try it some day but to be honest, it’s just not necessary. I didn’t have any when I started experimenting with hummus years ago and I’ve never missed it. The garbanzo beans and pinto (I normally use pinto – they give it a beautiful creamy texture) make this such a nutritious snacking option high in fiber and protein! Take a peek at the nutrition facts of chickpeas. I keep it on hand almost always in the refrigerator – check out How To Feed A Busy Family on setting your family up for success with snacks and quick food options. We use cucumbers, broccoli, carrots, peppers, toasted whole wheat tortillas as well as toasted pita bread for dipping! Place all ingredients except olive oil into food processor and once processing, drizzle oil through the opening slowly until desired consistency is reached. My family loves this hummus best when chilled and served with whole wheat toasted tortillas. Chips are also a winner, but if we are being good then I always try to toast some tortillas. 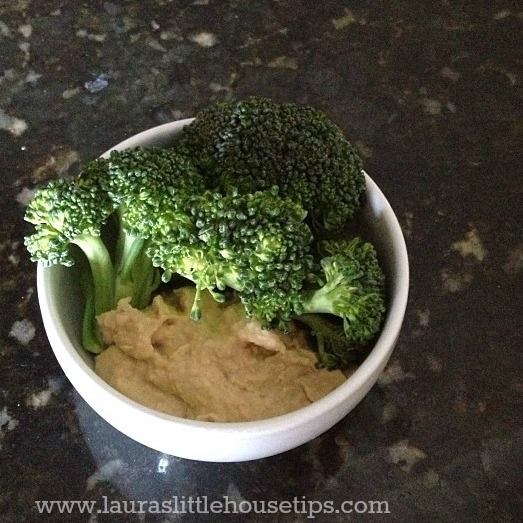 I am not normally a lover of raw broccoli but this hummus is magical… I LOVE it with raw broccoli. The two flavors are very complimentary! Do you have any favorite hummus ingredients? Or foods for dipping? Leave a comment and let us know! yum. I’ve never made my own hummus. I should try! I have never made my own, either, but now that I know I can, I am all over it! Me neither but after seeing this I so need to give it a try! I have actually never made my own hummus before. This will be great for the next time we have a party, though! This is a great idea! I love hummus, but quality hummus can get expensive. I’d much rather make it myself. That’s the truth Jennifer! And for what goes into it it’s a ridiculous price. I’ve tried hummus before but it was the store-bought kind. A homemade version would certainly taste better! Let us know if you try it, won’t you, Dede??? I’m just starting to like Hummus, it took me forever to tolerate the taste. lol. I need to try this recipe soon! I love Hummas! Sounds like a simple and tasty recipe, I’ll have to give it a try! I’ve finally admitted I’m totally addicted, Meagan. lol! I tried to make hummus the other day and it was a total flop! I’ll have to try this recipe! I haven’t had hummus for years and never thought of making it myself. This sounds perfect and much healthier than the store-bought ones, I am sure! years, shauna?? where’ve you been? hahaha… Thanks for stopping in! I cannot get enough hummus and need to start making my own! This recipe is definitely how I’m going to start! Thanks for sharing! You’re a fellow hummus lover, Shelley??? YES!!! hahaha… it will probably be my demise. I’m hopelessly addicted. Wow,I have always wanted to make my own hummus. Seems easy enough, and the flavor possibilities are endless! yes, amy! Is it normal that I feel bad for not ever changing this recipe up? I keep thinking about it but love it so much that when i go to make it — it just comes out the same way! LOVE!!! I have, too! I just never took the time. This looks like a super easy recipe to try. I love making my own hummus! SO good! Chelley @ A is For Adelaide recently posted…LPA Conference Tips! I’ve been thinking of changing things up Chelley… don’t you think roasted chipotle sounds good? Do you do yours spicy? I’ve never made it with jalapenos before, but oh my goodness, yes! I’m going to do that now for sure! I’m hoping my jalapeños do well in the garden this year for this very reason Liz! What I canned last year made us hummus all year! I’m so glad I found this post. I’ve been looking for some new hummus recipes to share with my mom and cousin. YUM! Cool Tiffany! I hope everyone enjoys! I was just thinking roasted chipotle would probably be phenomenal in it! 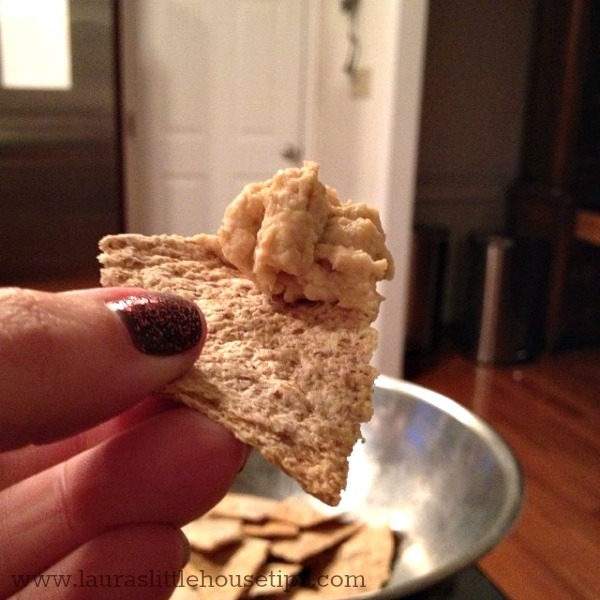 Can you believe this – I actually have never tried hummus! I love how you added jalapenos for taste, so I think I’m definitely going to have to try this recipe out! I hadn’t til I was in my 40’s Courtney – I’m sure you’ll be glad you try it! It’s soooo good! That sounds like a great recipe, I am gonna have to try it out! I make it a little different, but I am ready to switch it up, and your recipe sounds fabulous! I SHOULD switch mine up Kelsey… it’s too easy just sticking to the same old thing. What do you flavor yours with?! Mmm, looks delicious! I think I’ll try this. Thanks for the feedback Sarah… we really appreciate it. Let us know if you give it a try, won’t you? LOVE humus! It goes with practically anything! Your recipe sounds good! Mama to 5 BLessings recently posted…Super Saturday Giveaway Linky — Enter, Share, Win! Thank you so much… It’s probably not hummus etiquette, but we have no complaints around here! Awesome for something cool in the summer too. I bet roasted chipotle would be good too. This looks yummy. We love hummus. Sarah @ Must Have Mom recently posted…10 First Aid Tips For Summer! We eat hummus all the time in my house, but for some reason I rarely make my own. It’s obviously quite simple, so I need to start doing it! This sounds like it has more of a kick to it than my personal hummus recipe. I can’t wait to try it! I absolutely LOVE hummus! It’s one of my favorite snacks! I can’t wait to try making it at home. Thanks for this great recipe! I love making hummus for my family! My daughter lives for tomatoes and hummus in the summer! What a great idea to dip veggies in – that is how like mine also. What a great recipe. Hummus is one of my favorite snacks and yes so easy to make. You don’t use tahinini in your recipe so that is even easier. My daughter is always looking for hummus when she visits. I need to have a good recipe to prepare! Yummy, I’m just beginning to get into hummus and hadn’t considered making it myself. I bet this is delicious with fresh pita! You’ve inspired me to try and make my own! I love hummus and in light of the last Listeria scare, it’s time for me to try making my own! Jessica Harlow recently posted…It’s okay to say No. I agree Jessica.I’m tired of all the scares. This really only take a few minutes and I know what is in my food. That gives me confidence. I’ve always wanted to know how to make hummus. I know what I’m making tomorrow. Mmm, what a great recipe. Love hummus, my kids will be happy when I use this one. I’ve never tried humus before. This looks pretty good. I like the jalapenos to give it a kick. I love how easy it is to make hummus and how healthy it is. This recipe is right up my alley and seems full of flavor. I’ve been looking for ways to make hummus at home. Love this as an afternoon snack with some crackers and veggies! I love hummus, but I had no idea it was so easy to make. This sounds way better than store-bought! 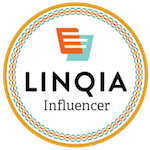 Courtney recently posted…Social Print Studio Giveaway…! I never knew much about Tahini until I bought a can for making hummus. I highly recommend using it! But, my absolute favorite ingredient is roasted garlic. Yum! Hummus such a great snack during the day. Especially good with pita bread. Thanks for the recipe. I love hummus, I’ll have to give this recipe a try soon! My sister-in-law just recently introduced me to hummus. It’s different, but it’s good. That looks like a really tasty hummus recipe! I haven’t tried too much hummus in my life, but I will be trying this recipe! That is an awesome idea! I use a lot of coffee pods, so it would be great to reuse them! I will not lie, I haven’t much enjoyed hummus in the past but I like your idea of using veggies. I have only used chips before. Thank you for sharing. I love hummus. I use it for dips for everything. I have to try making this recipe. Our Family World recently posted…What Other Issues Can I Expect When Dealing with a Speech Delay? I have actually never tried hummus before. I have heard that it’s really good, I just always forget about it. I’ll have to try out this recipe to see how I like it. I’ve never tried hummus before, but the ingredients sound tasty! I may have to give this a try! Oh wow… my step mother used to make Hummus all the time and I never learned how. Thanks so much for sharing. I have never tried making my own hummus before. I will have to make some this weekend for the kids. I love hummus. I always keep garbanzo beans in the house. Homemade hummus is the best! I’ve been wanting to make hummus but haven’t yet. I need to get on that. My love for hummus knows no bounds! That looks delish! I’d love to make my own hummus! I’ve actually never really tried it. Yumm. Love Hummus. This looks so good. Thank you Debbie. It really is so yummy!